Leaked images of Word Flow for iOS shows a more natural layout for thumb typing. Windows 10 Mobile users have reason to be jealous of Microsoft’s Word Flow keyboard for iOS. Images of the unreleased software keyboard, published by The Verge, show a unique one-handed mode, with keys that fan outward from the corner of the screen. Windows 10 Mobile also includes a one-handed mode, but it’s more simplistic in that the keys merely squish closer to one side. While we haven’t tried Word Flow for iOS—it’s currently in private beta testing with some Windows Insiders—the fanned layout seems like a better approach. With a large phone like the iPhone 6 Plus, the thumb already tends to move in an arc around the corner of the screen, so Word Flow’s one-handed mode should feel natural. 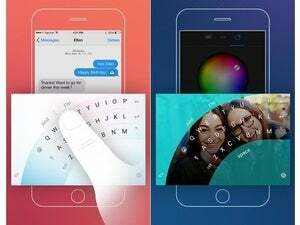 Word Flow for iOS is otherwise similar to the Windows 10 Mobile version, The Verge reports, with swipe-based typing, word suggestions, and emoji shortcuts. Users can switch to the one-handed mode by tapping one of the fan-shaped buttons on either side of the word suggestion bar. There’s no word yet on when Microsoft will release the keyboard for all iPhone users, and it’s unclear how Microsoft will attempt to make money from it. An Android version is also coming some time after the IOS release. As for Windows 10 Mobile users, Microsoft hasn’t said whether the fan layout is coming to its own mobile operating system. Why this matters: Although Word Flow isn’t drastically different from other touchscreen keyboards, its top-notch word prediction and gesture typing have made for a pleasant typing experience on Windows phones. The new one-handed mode looks like another nice touch—one that might help Microsoft’s keyboard stand out from other third-party options such as Swype and SwiftKey.